Good afternoon! It's matchday again, and our glorious Red Bulls have travelled to French-speaking Canada for a massive fixture against the Montreal Impact (7:30pm ET, MSG, match notes here). The Red Bulls have won their previous two meetings, against Montreal, this season and will look to complete the sweep. That said, let's look at how both teams come into this one. The Impact come into this one having won just two or their last seven games. This battle of World Cup Winners promises to be the first sellout since Montreal moved back into an expanded Stade Saputo. With it's defense finally healthy, the Impact will hope third time's a charm against the Red Bulls this season. 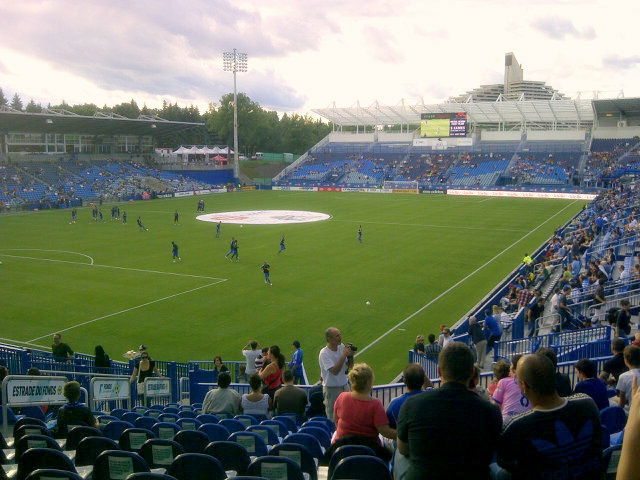 After a pretty good three game homestand (2 wins, 1 tie), the Red Bulls will be wary of Montreal's potential @Stade Saputo. New DP signing Tim Cahill will not be available for this one. Which formation Coach Backe uses is anyone's guess, but coach Backe faces tough choices, as players return from Injury. Thierry Henry is expected to start, as this match is on a grass surface. Also, DJ Jan Gunnar Solli and Ryan Meara are expected to return after long spells out through injuries. Will the Red Bulls make it three wins against L'Impact this season? Well soon see. In the meantime, let's get to some predictions. With the three-game homestand behind them, the Red Bulls should be riding a wave of good feelings going into Montreal. Tim Cahill probably won't play - and may not play for several weeks - but I still like RBNY to take a point or more from the Impact. Their newly-signed DP striker Marco di Vaio hasn't exactly gotten off to a great start, and Alessandro Nesta may be shaking off some rust. I'll go with a 2-1 RBNY win. Goals from Le Toux and Henry. Di Vaio gets off the mark for Montreal. I like our Red Bulls chances here. Our attack should be able to take it to the weak Montreal defense, and the return of Heath Pearce, hopefully in the place of Roy Miller, should help to shore up our defense, even with Brandon Barklage's absence on the right side. I see a handy 3-1 victory. Le Toux gets his French on in Quebec with a brace. Henry will have, how you say... a je ne sais goal... as well. You have to think confidence is high with the Red Bulls coming off 2 big wins when, honestly, most fans would have been satisfied with at least one tie given the brutal heat. The biggest challenge may be how Backe integrates returning players--especially in the midfield where the team is spoiled for choice, even before Cahill takes the field. With LeToux, Henry and the resurgent KFC on the pitch, the Impact defense will have tough calls to make when trying to shut down the Red Bulls attack. I'm calling it 2-1 for the mighty Bulls. The Bulls should be on a bit of a high confidence wise, so I fully expect them to crush the Québécois, with our French speaking strikers telling them who's the big boys of the East. Cahill won't yet be ready to run through walls for us, and of course we won't have Ballouchy available over the border, but we now have enough depth to compensate and so the best attack in the conference will overwhelm the worst defense in the league, 0-4. That's it for me! Let's hope for a big Red Bulls victory and will hope to see you soon, @The Cathedral of Football, Red Bull Arena (built by Makita). Viper Out!